Your gifts help us to inspire and educate visitors of all ages. Donating to the Garden is easy and tax-deductible. We thank you for all donations that ensure the future of The Oregon Garden. The Oregon Garden was a longtime dream of a group of dedicated Oregon nursery owners. During the late 1990’s that dream became a reality. The Oregon Garden Foundation officially broke ground and began building Oregon’s botanical garden in 1997. The Oregon Garden opened to the public in 2001. As we approach twenty years of the Garden being a reality, we appreciate each and every donation that supports our current programs and new dreams to enhance and develop the Oregon Garden. The Oregon Garden Foundation Board includes seven Directors who support the Garden’s mission and enhance philanthropy while providing oversight to the Garden’s future. Verl Holden – Garden Founder, Holden Wholesale Growers, Inc. Sponsor an annual planting in memory or appreciation of someone you care about! Renew your gift annually in order to keep your recognition displayed in the Garden. A custom plaque will be placed in our annual plantings from May to October. Watch your gift grow each time you visit the Garden. The Horticultural Enhancement Fund will be used to support planned projects and supplies proposed by the Horticulture Department and approved by The Oregon Garden Foundation’s Board of Directors. With a continuous stream of fundraising sources and growth each year, the HEF will be able to invest thousands of dollars each year directly into the Garden. The proceeds from each brick goes into our Horticultural Enhancement Fund. 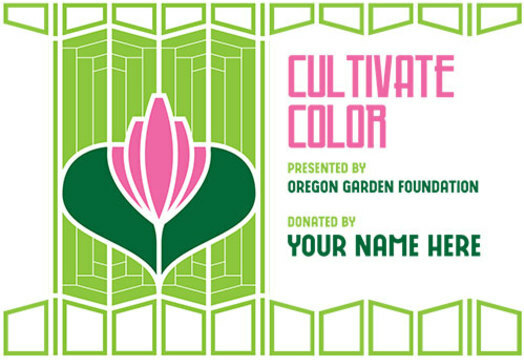 Leave your mark in The Oregon Garden with a commemorative brick! We are happy to plan with you your legacy gift or a memorial bench should you wish to include The Oregon Garden as part of your estate plan. Contributions may always be given in honor or memory of a loved one, and recognition of these gifts will be placed in the Garden’s newsletter. Thank you for supporting your Oregon Garden! Allison Pennell at 503-874-2535, foundation@oregongarden.org or online here. Thank you for your continued support and interest in making The Oregon Garden a world class Oregon destination.